easy to 're-kit' and be provided with some new details and materials in their transformation. 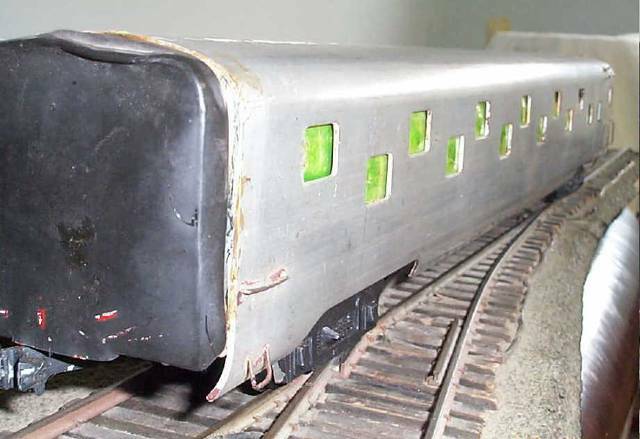 Here are before and after photos of a 'junker' Kasiner observation car found on eBay for $10. It was originally built from a 1948 kit and rebuilt with full interior detail in 2006 as B&O's 'Genesee River'. The Kasiner car, as delivered. The rebuilt Kasiner observation as the "Genesee River." Three prototypes were built for the New York Central in 1939 by Pullman Standard and named Genesee River, Maumee River and Wabash River. They were assigned to the Southwestern Limited, between NYC and St. Louis. NYC sold them to B&O in the early 1950s. where they were put on the National Limited until that train was discontinued as B&O was "Chessie-ized" in the mid 1960s. 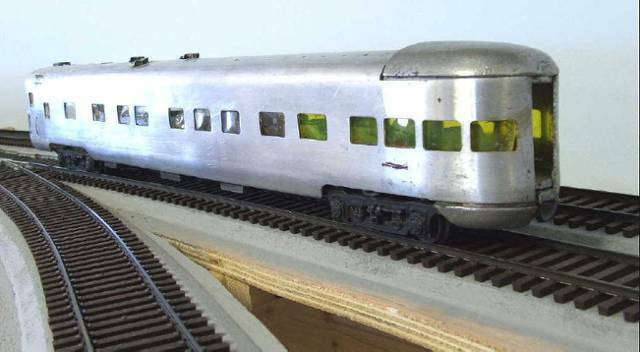 Another Kasiner kit modeled Pullman's demonstrator 24 duplex roomette car of 1942. With WW II coming on, it worked in pool service with a two-tone gray paint job until after the war, wearing the remarkably unimaginative name of 'Duplex Roomette I." In 1946 it was renamed L S Hungeford, after deceased Pullman executive and painted for service on Great Northern's Empire Builder. Pullman retained ownership of this car after the divestiture. 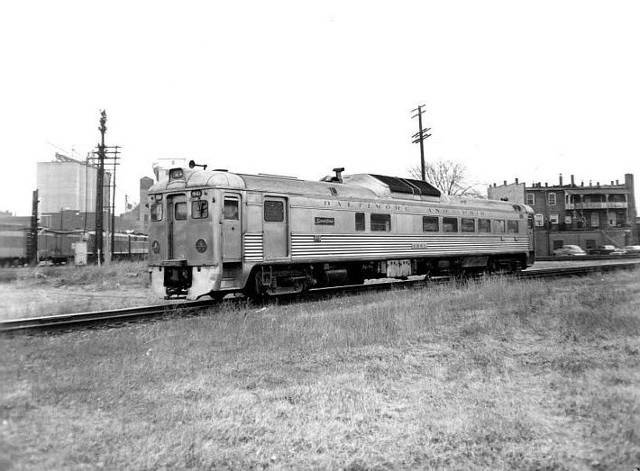 In 1950 the car was reassigned to B&O, where it usually was on the Ambassador between Washington DC and Detroit. In rebuilding this car, the interior was fully detailed with 24 duplex roomettes, passengers and indirect LED lighting. To do that the LEDs were mounted facing up to the extruded aluminum car's ceiling, which was polished to be reflective. The result is very even soft lighting in the car. Here is the exterior of the rebuilt Kasiner 24 duplex roomette sleeper in B&O livery. In 1964 the car was sold by Pullman to a used equipment dealer who in turn sold it to the National of Mexico which renamed it Paricutin, after a volcano. It may have been used in Mexico City to Yucatan service until that ended in the late 1970s. Next, is an old Walthers observation from the early 1940s that modeled a 2 drawing room/3 compartment lounge/observation built in 1928. Originally named in the "Crystal" series, they were given air conditioning in the late 1930 and renamed as the "Golden" series. 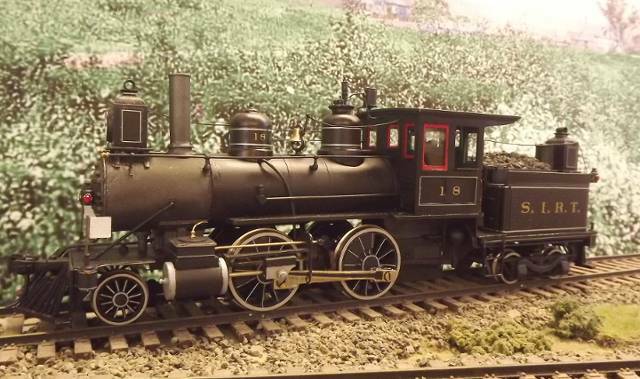 This Walthers model had wooden ventilators and a built-up brass end railing, of which two sections were missing. Two missing car steps and had only one truck. It will get a new life and identity after rebuilding. 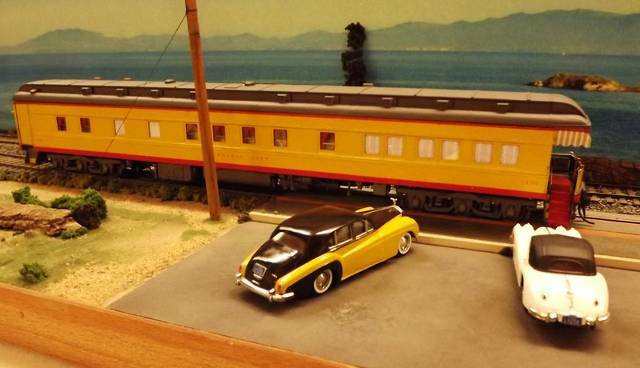 Here is the transformation of the old Walthers car, which accurately models the private car of Lucius Beebe and Charles Clegg of 1954-1966, the "Virginia City." In Pullman service it had been named "Golden Peak." Lest one thinks I only work on passenger cars,two structures follow here. In the mid 1950s, the Corman (?) 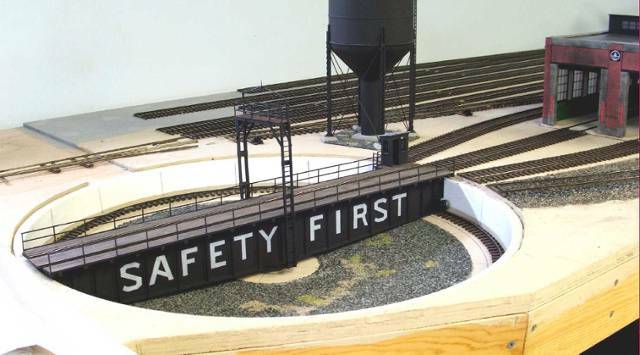 Toy Company made a 24" diameter turntable for use with Lionel trains. The pit was aluminum, shaped very much like barbeque pits of the day made in steel. The turntable bridge was solid wood with thick plastic sides. It came with a piece of Gargraves 3 rail track, a solid wood control house and a control pad with buttons. Two "D" cell batteries powered it though a reduction gear drive at the center pin. Here is my 55 YO turntable in 2008, being installed on the layout. Some changes will be made! The bridge was modified to have the end wheels ride on cut-down flex track fitted into the pit bottom rather than the pit bottom itself. The bridge was given scale sized sides, 2 rail track, wood walkways, railings, a scratch built control house and gantry for overhead power. The pit was finished with some paint, ballast, marker pen lines, colored sawdust and some lichen weeds. 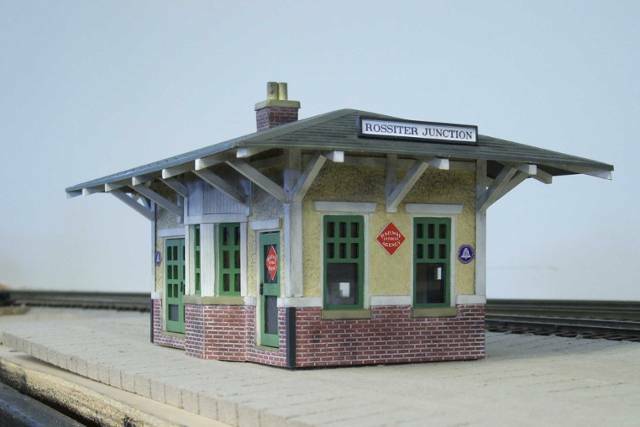 Full size kits for an RDC were scarce in O scale. Mac Shops offered some in the late 1980s. Today we have imported, factory built models from which to choose. Here is a Mac Shops kit being built into a B&O RDC-2 "Speed Liner". 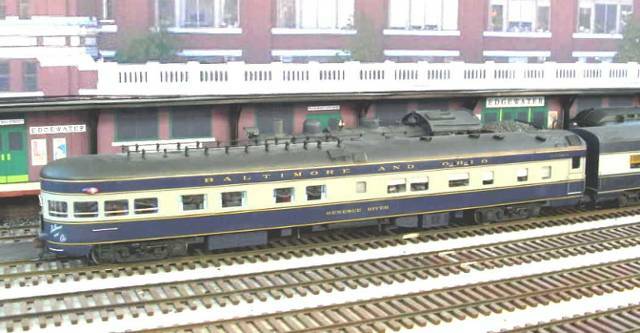 B&O had two built by Budd in 1956 as coach/dinettes for Washington DC to Pittsburgh service until the mid 1960s. Here is one of the B&O "Speed Liners" holding down an unusual assignment: Weekend runs over New York Central track B&O used to reach Detroit in the late 1960s. To keep the agreement open, B&O had to run at least one passenger train a day, even if none were scheduled. Compare this photo with that of the kit. There are a number of changes needing to be made! Here is the completed Mac Shops kit as B&O 1961,an RDC-2 coach/dinette Speed Liner. Like the prototype this model has a small kitchen area and table seating for 24, along with reclining coach seats for 24. The back end of the RDC has a diaphragm which B&O provided so passengers from other RDC units in a train could more easily reach the dining area of this car. The model is powered with two Magic Carpet units in the forward truck, directional head and marker lights, interior details, lighting, passengers and crew. I wrote about the interior of this Speed Liner model. This is how I set it up, following the Budd/B&O floor plan. The kitchen is roughed in but not detailed, since it can't be seen through the two frosted windows. As I'm not an electronics expert and LEDs are s a mystery of sorts, the interior is lit with 12volt Grain of Wheat bulbs wired in paired series. The wiring taped to the ceiling is for the constant/ directional head and marker lights. How about a caboose job? Here is a 4 wheel caboose built from a 1953 Train Craft kit (number 502) that was rebuilt a few times over the decades. This is how it looked after a rebuild in 1983, which added more details. 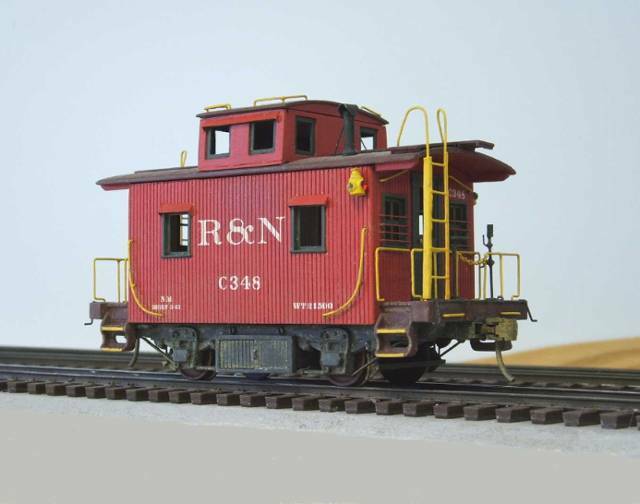 The R&N is for a former model railroad named Richmond & Northern. 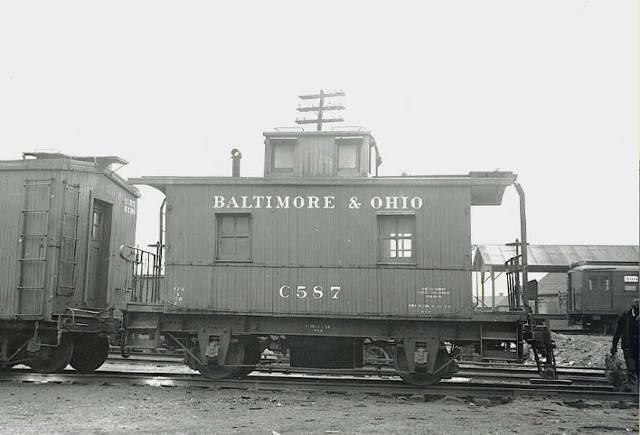 This B&O Class K-1 caboose was photographed at the St. George Yard of the Staten Island Rapid Transit, B&O's New York Terminal subsidiary, in the late 1930s. The old Train Craft caboose is very close to the size of this prototype. Cabooses in NY Terminal service lost their cupolas by the 1940s. Removed as they became victims of age and rot, they we not needed in terminal and short transfer operations. So here is B&O C-587 in O scale, as it looked just before WW II. 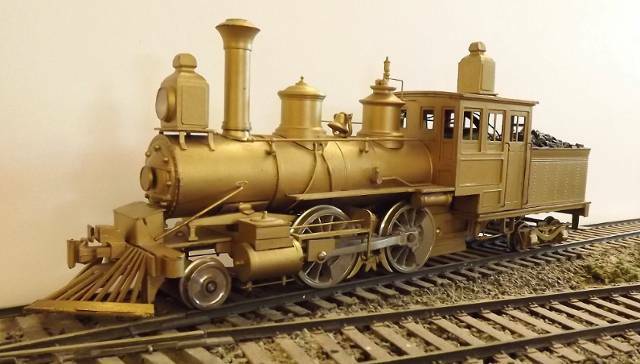 Among the changes made were new end railings made to the B&O design with brass rod and strip, new grab irons, relocating the smoke jack, adding body re-enforcement bands and adding some missing truck frame details. 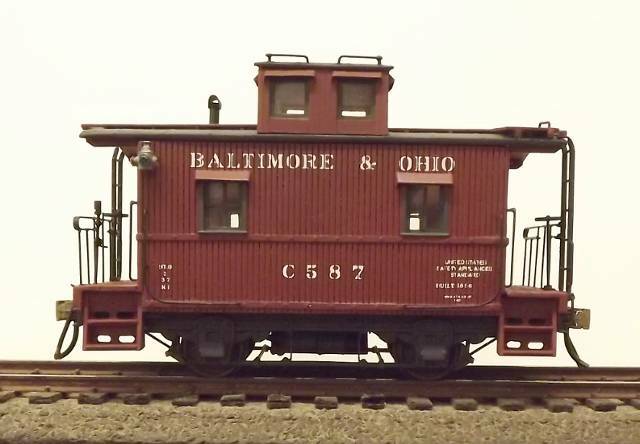 The model is painted freight car brown, which B&O used on cabooses until 1943, when Devil's Red was coming into use. The model carries lettering of the prototpye which dates from the late 1920s when "United States Safety Appliance Standards" was applied to older cars that had been refitted to meet the latest grab iron and hand rail requirements at the time. Something a little different. Back in the mid-to-late 1930's, cast aluminum car kits were made in O Gauge (as it was known then). They were more expensive than the usual wood and cardstock kits. They also could be a challenge to assemble. Some were put together with small machine screws. Others used copper pins or rivets. Other than horsehide glue, not much else could stick to aluminum. Consumer available epoxies would not arrive until late in the 20th century. This USRA two bay rib side hopper had been assembled with brass rivets and Duco cement, making it a late 1940's build. It was found on eBay, painted and lettered for Missouri Pacific. It had oversized handrails and grab irons, some missing as well. It was from a 1937 Scale Craft kit which back then included the trucks. 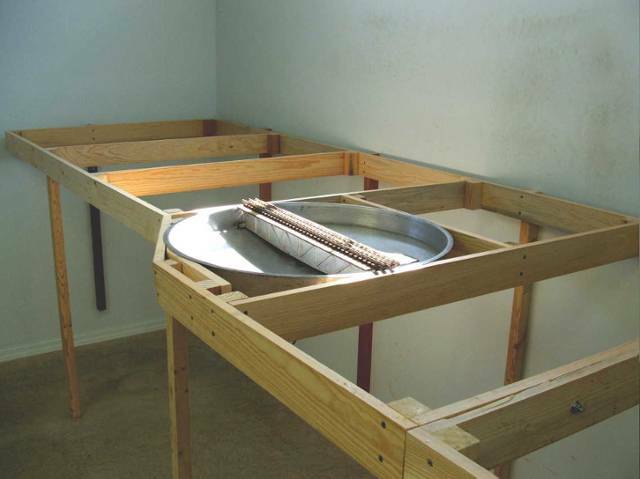 Here, the kit has been rebuilt and outfitted with closer-to-scale hand rails and grab irons. Two part epoxy cement and ACC were used along with new alignment pins made from brass rod in re-assembly. 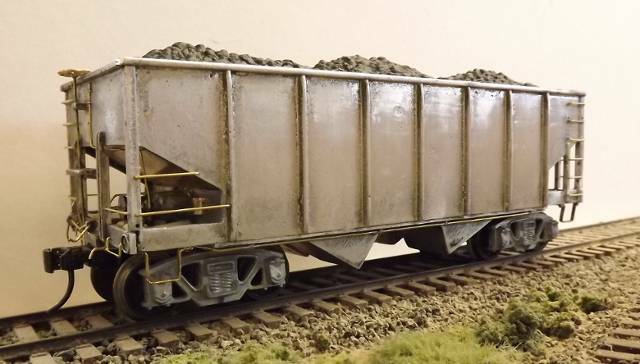 An Intermountain hopper coal load fitted perfectly, in spite of the seven decade difference in their ages. 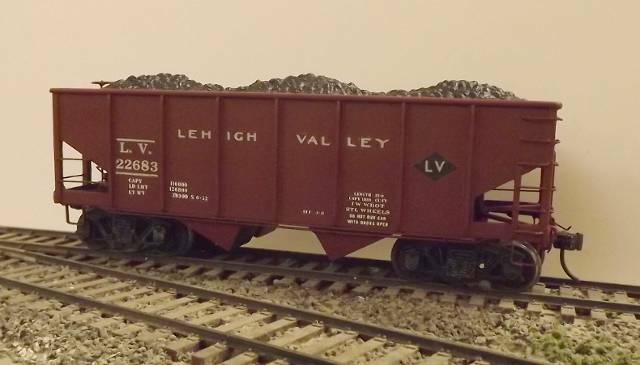 Here is the 80 YO Scale Craft aluminum hopper in Lehigh Valley livery, done in May of this year (2017). In the 1970's, Balboa Scale Models San San Diego CA imported this O scale Illinois Central Forney engine. The prototype was built by Rogers of Paterson NJ in the late 1880's. They were used in IC's Chicago suburban service and at the Columbian Exposition of 1892, where John Luther (Casey) Junes was assigned to run one in shuttle service. Being b-directional by design they ran in either direction and did not need to be turned at the end of a run. Most were used in elevated railway and suburban service until it was electrified. IC did that in 1924. One of the IC Forneys is still around, at the Illinois Transportation Museum. But this model is destined for another life. And here it is now, as Staten Island Rapid Transit 18. The prototype was one of three built by Baldwin in 1892. 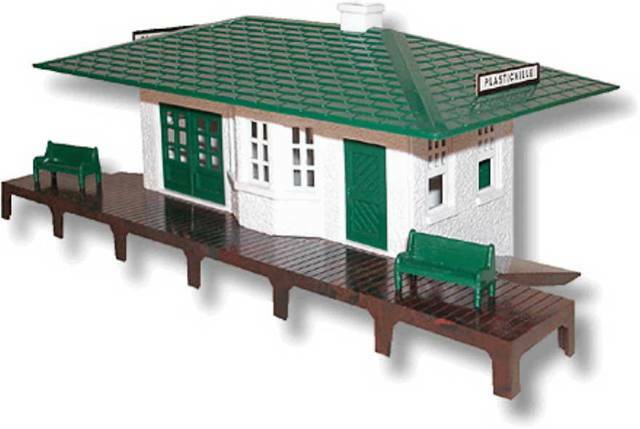 The model was extensively rebuilt and re-detailed. It was re-powered with a Swiss instrument motor that is completely hidden inside the boiler casing in the cab. Paint, striping and lettering follow B&O practice post 1885, when B&O standardized locomotive classes and numbers system wide, along with their paint, striping and lettering. SIRT was the B&O New York Terminal subsidiary for freight service from 1890 to 1980. SIRT also operated three sub-divisions for passenger service, coining the term 'rapid transit' in 1883. SIRT 18 was sold in 1906 to a lumber mill in Alabama, when SIRT had to convert to burning anthracite coal to meet new metro NY area anti-smoke regulations. SIRT was mainly a Cook/ALCO buyer with 30 of their Forneys, The three odd Baldwins were sold, rather than rebuild them with Wootten patent fireboxes for burning hard coal. 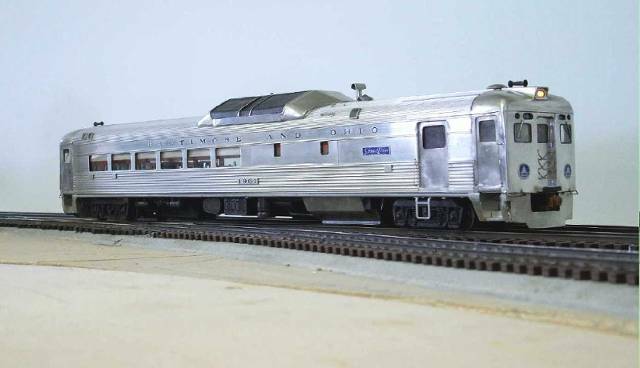 The Weaver WW-II Pullman built troop sleeper and express car conversion were among the first prototype specific cars they produced for both three rail and two rail O scale. Well detailed, with dual brake systems and accurate paint jobs they were popular. But as time passed a hidden flaw damaged some of them. The highly detailed underbody floor and underframe were made of cast zamac. Due to impurities, in time those castings grew and curled. In some cases that split open the ABS car bodies. At he time no replacement floor/underframe castings were available from Weaver as the cars had been made in China. If an owner caught it in time, they could save their car and make a new floor for it. While making a new floor from some ABS and styrene sheet, the REX car underwent a transformation into a B&O Class C-17 express car. Roof vents were added, the car ends modified to more closely follow what B&O did to their 100 troop sleepers, and the side doors were replaced with new doors that are wider and lower to do the same. The steam pipe under the car was raised up as iy hung too low on the Weaver REX. Since the new floor was lighter than the cast zamac floor it replaced, a piece of 3/4" plywood was fitted to the interior for weight. A B&O paint, striping and lettering job finished the car, now safe with a new floor that should not 'grow' as it ages.